At the push of a button, the patented telescopic lifting arms of the PowerLoader retract and curl in seconds to eliminate leverage-moving loads of up to 350 lbs from ground level to "Locked and Loaded" - ready for transport. The PowerLoader is constructed of super-tough, aircraft aluminum and adds on 29 lbs to the weight of the vehicle. 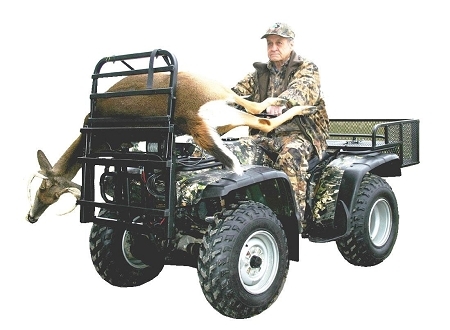 Powered by a regular winch, the PowerLoader installs on any regular 4-wheeled ATV, golf cart vehicle or outdoor utility vehicle in just minutes and comes with a rock-solid one year warranty. Straight off the showroom floor, an ATV can take you over rough terrain, through mud, through water - basically take you places where nothing else can go. Add the amazing PowerLoader from Great Day and your ATV is transformed into a "Juiced Muscle Machine"
Honda, Kawasaki, Suzuki, Bombardier, Polaris, Arctic Cat & Yamaha. 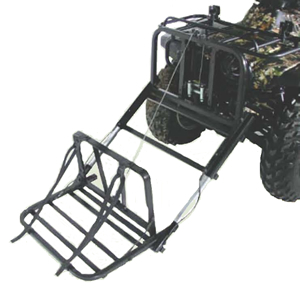 All Polaris brand ATV's require an additional mounting kit for proper installation. NOTE: Modification and/or drilling to the vehicle may be necessary for installation.